Young, dynamic and creative – for years, Berlin has been known as one of the most exciting cities in Europe. In December 2016 and January 2017 alone, the German capital welcomed 12.7 million guests, who stayed for a total of 31 million nights. What’s more, the highest proportion of external visitors the city has hosted at any one time is 45.6 percent. Berlin always keeps us on our toes – whether guests choose to visit the Skywalk Marzahn (a skywalk fitted between concrete high-rise tower blocks), the city’s inoperative airfield, a swimming pool immersed in the River Spree, an open-air rooftop club, an urban gardening project or a street food market, the leisure options in Berlin are truly endless. Another factor that makes the city so unique is its remarkable history, which comes alive in many locations. Marks of National Socialism and memories of the Cold War, when the split city became the symbolic battleground between leading world powers, linger throughout Berlin. But while the former East Berlin has undergone a substantial cultural makeover since the late 1990s, it is the old West Berlin that is now facing the most significant tourism boom. 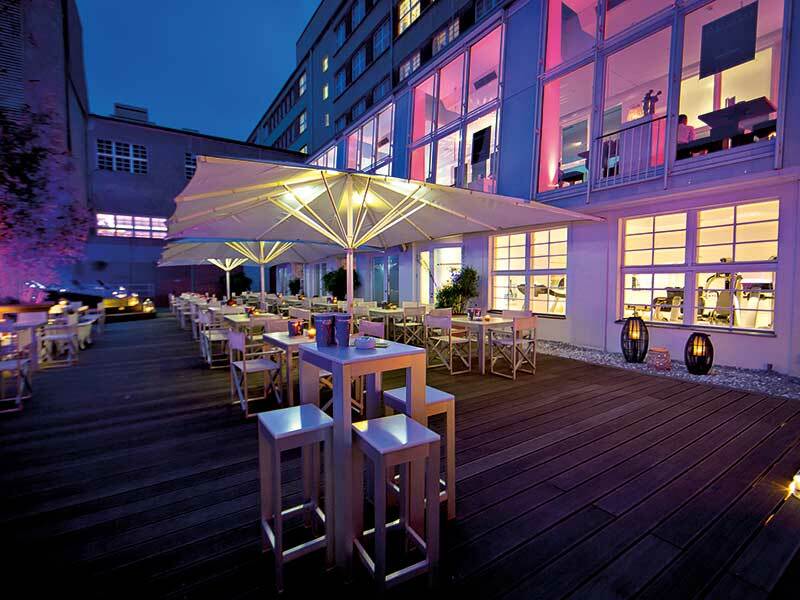 At the centre of this development, in the heart of City West, guests can find the Ellington Hotel Berlin. The hotel, which is located between KaDeWe and Breitscheidplatz, is celebrating its 10-year anniversary this year – yet the history of the building itself stretches far further back. Built between 1928 and 1931 in the style of New Objectivity, the Femina Palace, which boasted a unique grand ballroom, developed quickly into one of the most popular entertainment venues on the Kurfürstendamm. Even after the Second World War, the house remained an exciting place to go. Highlights such as the Jazz Club Bathtub, where artists such as Duke Ellington and Ella Fitzgerald performed, and later the legendary nightclub Dschungel, which David Bowie and Iggy Pop visited, are still remembered to this day. However, towards the end of the 20th century, the Femina Palace fell into disrepair for almost a decade. The arrival of the Ellington Hotel Berlin brought the historic building back to life. Whoever walks through the halls of the hotel today can discover many traces of the past, while cherishing the modern charm the hotel has gained during the last 10 years. The 285 rooms and suites range in size from 22sq m to 640sq m, but are all bright, modern and offer an open design – a perfect starting point for any exploration of the city. Furthermore, the hotel has a designated 1,490sq m conference and event area. Whether guests are looking for a flexible meeting room, an intimate wine cellar or a vast, historical ballroom, the range of opportunities is endless. One of the greatest highlights of the hotel is the open summer garden – a real oasis in the middle of the city. Here visitors can relax on the comfortable outdoor couches, making it an ideal spot for anyone who wants to take a break from the hustle and bustle of the city, or simply enjoy a few sunrays. When it comes to food, guests are spoilt for choice: they can choose to explore the various restaurant streets between Savignyplatz and Wittenbergplatz, or they can stay right where they are. The hotel’s own restaurant DUKE serves casual fine dining between the summer garden, open show kitchen and the bar. Here, Executive Chef Florian Glauert combines traditional French haute cuisine with regional produce to create truly outstanding dishes. A daily business lunch and an extensive wine selection round off the menu to perfection. Those who want to buy a souvenir don’t have to travel far. The hotel is surrounded by countless stores that mirror the diversity of the city and have become a key part of its culture in recent years. Explore the Nürnberger Street during a visit to the Ellington Hotel Berlin – it will be worth the trip.